Strawberries, Strawberries and More Strawberries! History has a way of repeating itself, doesn’t it? The whole time we were strawberry picking last Tuesday I kept saying “I think we have enough, remember the time we came back with 12 pounds of berries and had to throw half of them out?” Well, I guess we did a little better this time coming back with only six and a half pounds. What does one do with six and a half pounds of strawberries, exactly? 1. First off I took about half and quartered them (these berries are all very small) and sprinkled them with a few tablespoons of sugar and put them in the fridge. They will keep for several days this way and are a great topping for pancakes, waffles or just about anything for that matter. 2. Most of the other half went immediately to the freezer, this stash will last for a couple of weeks, maybe. Try this super easy sorbet recipe, so refreshing and you don’t even need an ice cream maker! 3. We are big smoothie people here, if fact next to “what’s for dinner?”, “can I have a smoothie?” is probably the question I am most often asked on any given day. 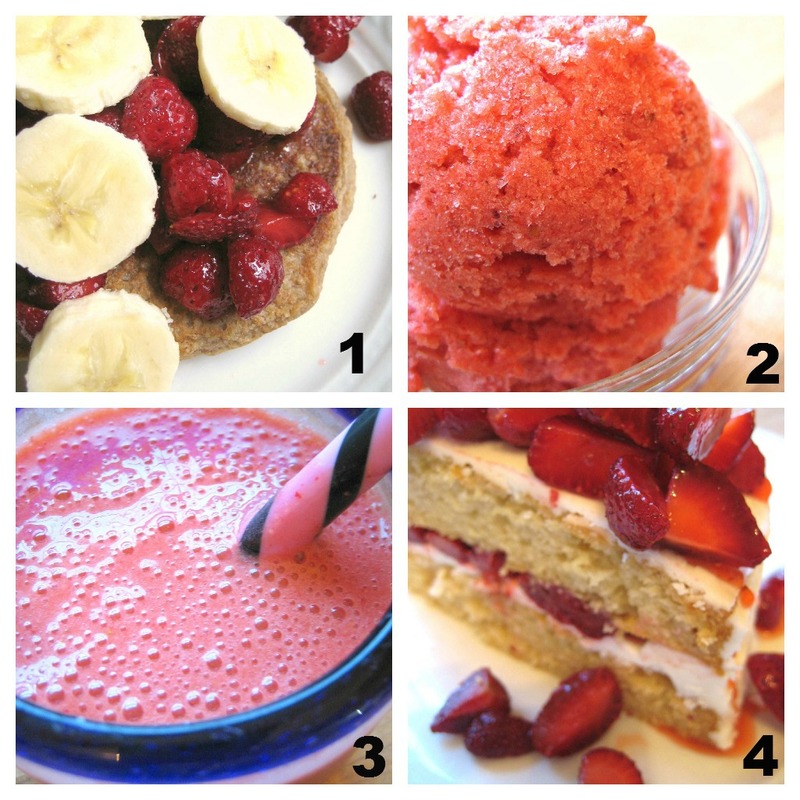 This one is: 1 cup green tea (cooled), 1-1/2 cups fresh squeezed orange juice (about 4 oranges), 1-1/2 cups frozen strawberries, 1-1/2 cups frozen bananas, 2 Tbsp. agave nectar, 1/4 cup almond butter. Yum! 4. I couldn’t help but pile this wonderful cake high with juicy strawberries, let me just say this was delicious. So, what are you doing with your strawberries so far this summer? I know it’s never a good idea to put the word surprise in the name of a recipe, it just seems like you’re trying to hide something. I guess in this case I am hiding something. To this… and not be surprised! Blam! Bet you didn’t see that coming. Combine the strawberries and sugar and set aside. Prepare flax egg and set aside. Combine dry ingredients in a large bowl and (you guessed it) set aside. In a small bowl combine milk and vinegar, stirring until it begins to thicken then add remaining wet ingredients including the flax egg. Add the wet ingredients to the dry and divide batter evenly among the cups in your muffin pan, taking care not to fill them too much because you still have to fit those strawberries in there. 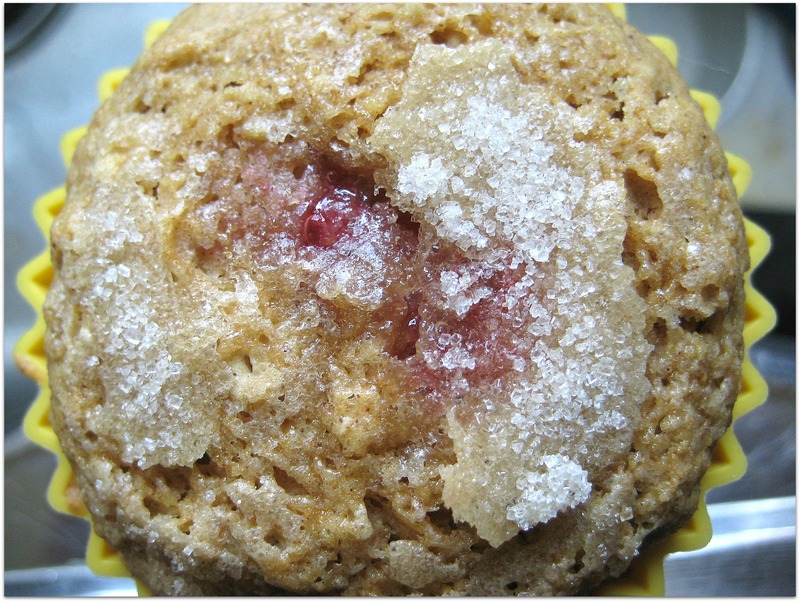 Place a strawberry in the center of each muffin, gently pushing it down to the bottom. Sprinkle each muffin with a little sugar if you choose and bake in a 375 degree oven for 20-25 minutes. 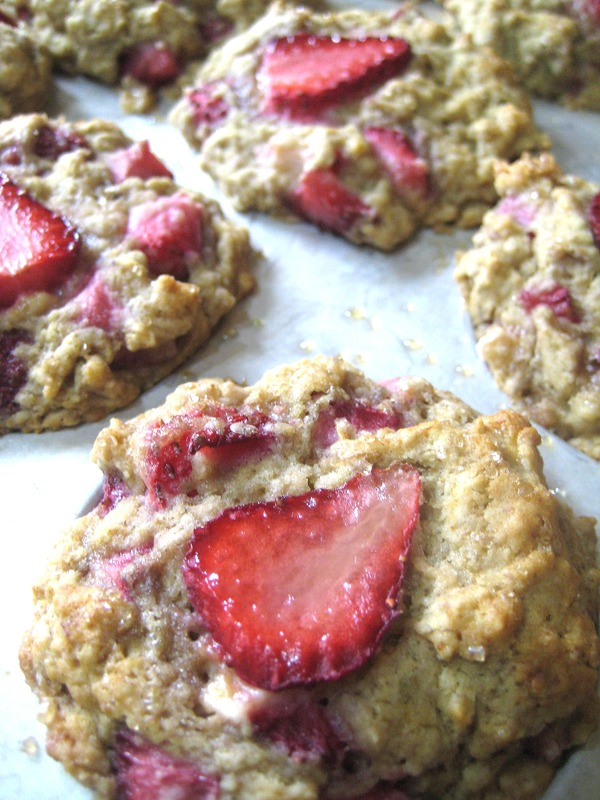 Let them cool slightly in the pan before you remove them so you don’t lose your strawberries when you take them out. 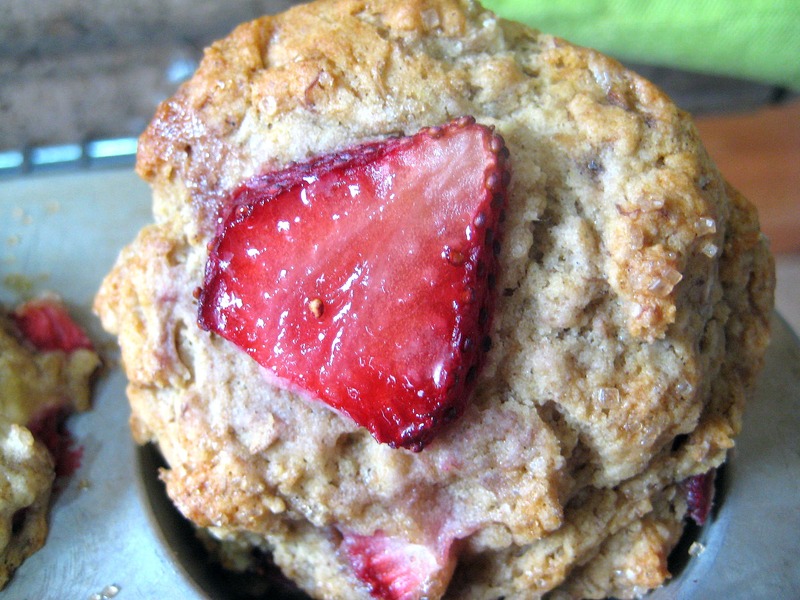 Vegan, Gluten-Free and Delicious: Strawberry Banana Muffins! These are crazy times we’re living in, it’s snowing in mid-March in Portland and I’m making gluten-free muffins, weird! I love gluten and gluten loves me, that’s my mantra people (ok, not really – but if I did have to pick a mantra that would be in the top 5). I can’t tell you how many times I have passed over a perfectly yummy sounding recipe solely on the grounds that it was gluten-free. 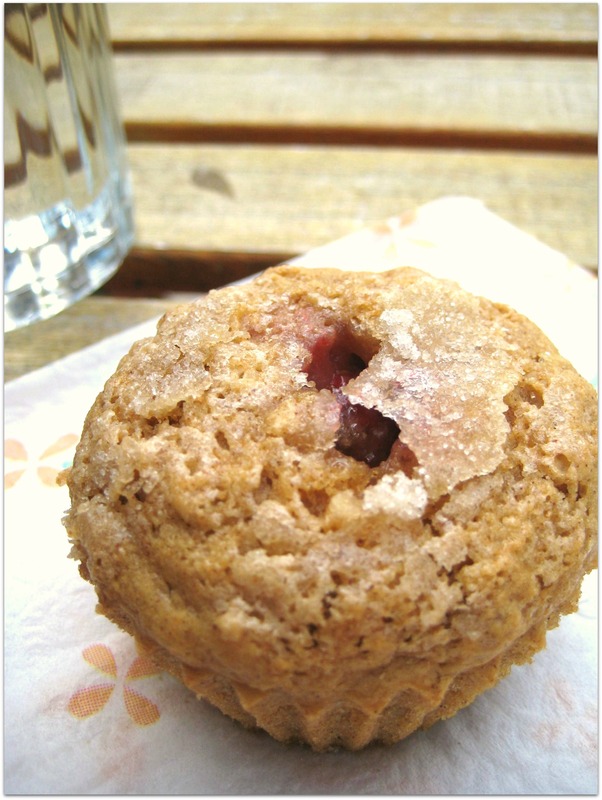 But a few days ago I was leafing through one of my all time favorite cookbooks, Moosewood Restaurant New Classics and came across a recipe for strawberry banana muffins which immediately went on my “must make now” list, but upon further inspection I realized it was a gluten-free recipe. Originally I was going to un-gluten-free it and veganize it but after a quick check around the kitchen I realized I actually had all the weird ingredients that go into gluten-free baked goods, I think it was just meant to be. Oh, hey and guess what…they are freaking delicious, soft and pillowy (my computer says pillowy isn’t a word, I say it is and these muffins are it)! Combine rice flour, potato starch, tapioca flour, xanthum gum, cinnamon, baking soda, baking powder, and salt in a bowl, set aside. In another small bowl (or your 2-cup measuring cup) combine soy milk, vinegar and ground flax seed whisking vigorously for about 30 seconds, set aside. In yet another bowl beat the margarine with an electric mixer until fluffy and then add sugar and continue to mix until combined. Add milk/flax mixture and vanilla to butter and mix until combined. 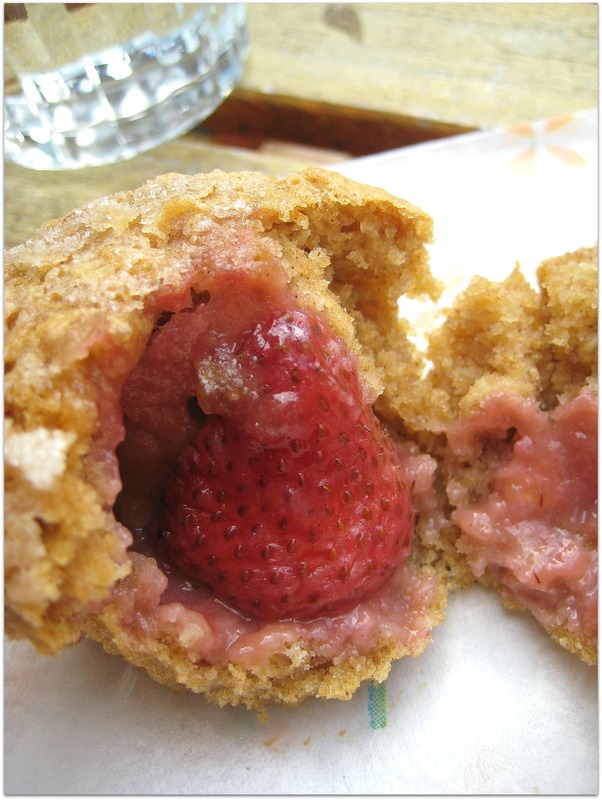 Fold in the banana and strawberries then add dry ingredients mixing until combined. Divide batter evenly in your lightly oiled muffin pan then top with additional strawberry slices and sugar if you are going that route. Bake in a 350 degree oven for 25-30 minutes. Let the muffins cool for about 5 minutes in the pan on a cooling rack before you remove them and let them cool completely.